Having problems with crossride & breakride? Here is the solution for you. [CONT](VC/RC):If you have a non-«Murakumo» vanguard or rear-guard, this unit gets [Power]-2000. 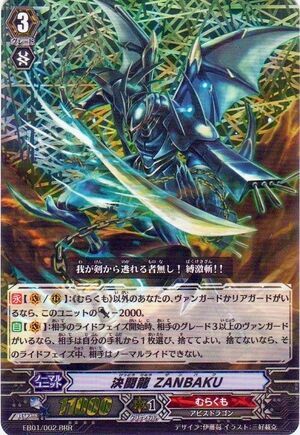 [AUTO](VC):At the beginning of your opponent's ride phase, if your opponent's vanguard is grade 3 or greater, your opponent may choose one card from their hand, and discard it. If they do not, your opponent cannot normal ride during that ride phase. Why is he the MVP, As you can see from my previous posts, I've been mentioning about the new card mechanics and gameplay of breakride & crossride. So how do I counter them. Note that for these mechanisms to work, they have to be rode by the same grade of grade 3 again. Therefore make ZANBAKU's effect nasty to -1 your opponent which they have to choose between riding the grade 3 or discarding a hand card. This can be annoying and risky for your opponent if he has no fodder or limited fodder to discard.and pay the cost. I sense a rise of price for this card. No reprints, yet so many crossrides and breakride around. This guy gonna be worth a bounty when the meta shifts again. At least 7 to 8 bucks.